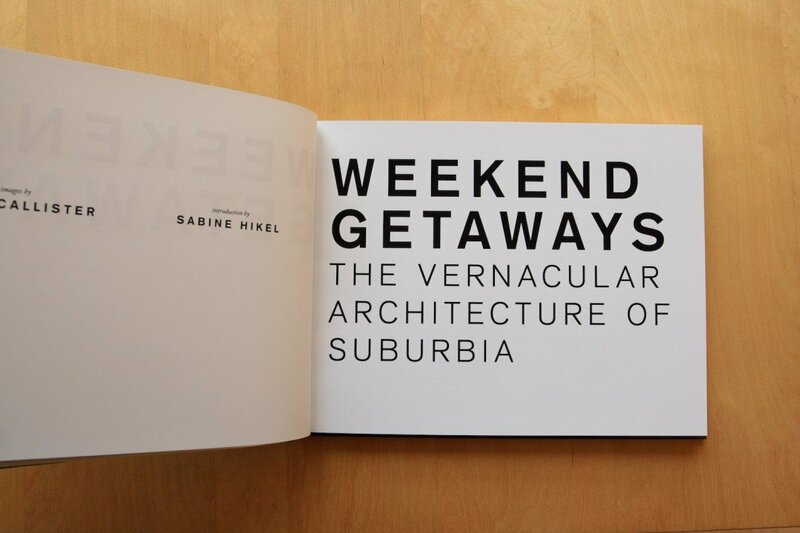 For Titles, I created Weekend Getaways: The Vernacular Architecture of Suburbia. This is a limited edition book, hard-cover, cloth-bound with foil-blocked embossed type on the cover, of approximately 100 colour pages. 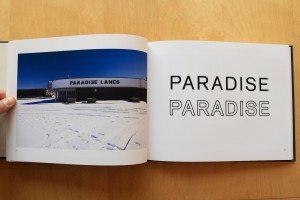 The book attempts to define the styles, tropes or semiotic of suburbs primarily through photographs, annotations, automatic writing, rigidly designed text and partial diagrams. The content will simultaneously challenge and reinforce the stereotypes associated with some suburban life. about wives walking pugs; about clocks striking the hours in empty rooms. The long-held antipathy towards the suburbs maintained by advocates of urban space —exemplified here in Cunningham’s novel—is nothing new. But at the beginning of the 21st century, that view has started to shift. 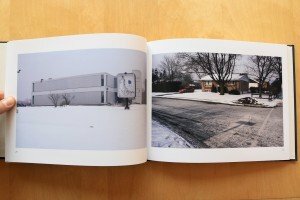 An appreciation of the suburbs as an important site of study and artistic production is emerging, and Andrew McAllister is one of the artists who is bringing this about. At once gorgeous, funny and disturbing, Weekend Getaways breaks from a stale tradition that treats the suburbs as limited and limiting; rather, the work suggests infinite possibilities for suburban exploration and reflection. Far from being a simplistic commentary on a stereotyped vacuous lifestyle, Weekend Getaways paradoxically provides viewers with an intimate glimpse of the suburbs via a methodology of detached observance. In keeping with McAllister’s previous work, human beings are noticeably absent from Weekend Getaways. This absence lends itself to the sometimes sinister, sometimes absurd quality of the work; the wide open spaces found in many of these images can appear riddled with loneliness. But like a blank canvas, they may also suggest hope and possibility. Although no human flesh is present, the signs of human existence dot the photos: tire tracks, foot prints in the snow, graffiti tags, a blurred face at the helm of a car. There is also real beauty, even when it is punctuated by hints of poverty or the glare of advertising. Sometimes the beauty is the result of nature butting up against the titular vernacular architecture: trees appear to emerge from restaurants, or mirrored buildings reflect fluffy white clouds. There are surprising splashes of colour, too, particularly the brilliant blue skies, or brilliant red signage sandwiched between a cloudy sky and snowy ground. Weekend Getaways, then, effectively situates sumptuously-shot parks and windswept landscapes as prime vacation spots that beckon to readers. 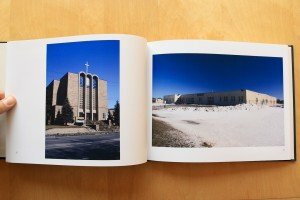 The actual cities in which the photos were taken are incidental; the suburban landscape presented here piques the viewer’s curiosity, much as the glossy pages of a travelogue incite wanderlust. 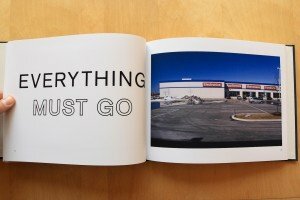 In doing so, however, it precisely throws into question the facet of suburban life that involves getting away from it all…at your local big-box store. Perhaps the most remarkable aspect of McAllister’s work is its humour. The laughs his work generates come, in part, from the element of the unexpected: where we anticipate the presence of people, there are none; this startles us into laughter. 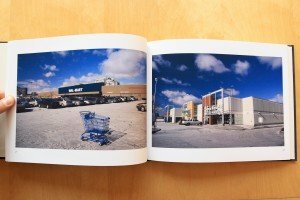 Through McAllister’s lens, strip malls and tower blocks start to seem funny, but only because our everyday relationship to these ordinary structures is suddenly detached and distanced. In the manner of Freud’s theory of the uncanny, the familiar becomes unfamiliar. We see structures we think we know intimately and yet find ourselves removed from them. The humour, then, is without condescension; it comes not from being positioned above the material but apart from it. The laughs come through as a joke on us, we humans who built the structures that, separated from their everyday context, suddenly strike us as terribly absurd. The images found in Weekend Getaways command readers’ attention by yielding themselves quietly and gradually. 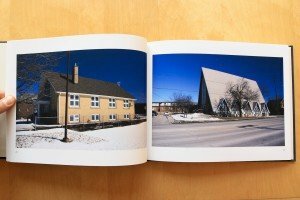 They invite readers to reflect on their own built environments and perhaps those of their childhood. After all, the generic flavour of the suburbs makes it easy for anyone to identify with abandoned fields, oddball retail outlets or vast parking lots dotted with vehicles. Neither apologia nor indictment, Weekend Getaways is a beautiful and surprising reconsideration of the suburbs whose time has come.